SAN DIEGO- Dribbling, shooting, set pieces, schemes and fun. Those are some of the things Club Tijuana and SDSU coaches offered during a joint youth clinic Sunday. More than 60 athletes in categories ranging from the Under-7 to High School age groups took part of the clinic at the San Diego State University (SDSU) Sports Complex. Coaches from Club Tijuana’s Xolos Academy FC and the university’s Mens Soccer team took players through several drills and teaching stations. Some of the stations included basic soccer skills and varied through different levels of technique that matched the teaching styles of both Club Tijuana and the Aztecs. The event was free to the public and it was offered as a way to keep the local soccer community close to both organizations. The Xoloitzcuintles along with SDSU, are committed to providing local youth the opportunity to receive quality instruction to help develop young athlete’s skills while having fun and developing a love for the game. Coaches Luis Guerra, Eduardo Martinez and Rafael Palacios represented Xolos Academy FC in Chula Vista, Calif. while coach Matt Hall and a handful of SDSU players were there for the Aztecs. Athletes who participated in the event received a special Club Tijuana T-shirt. 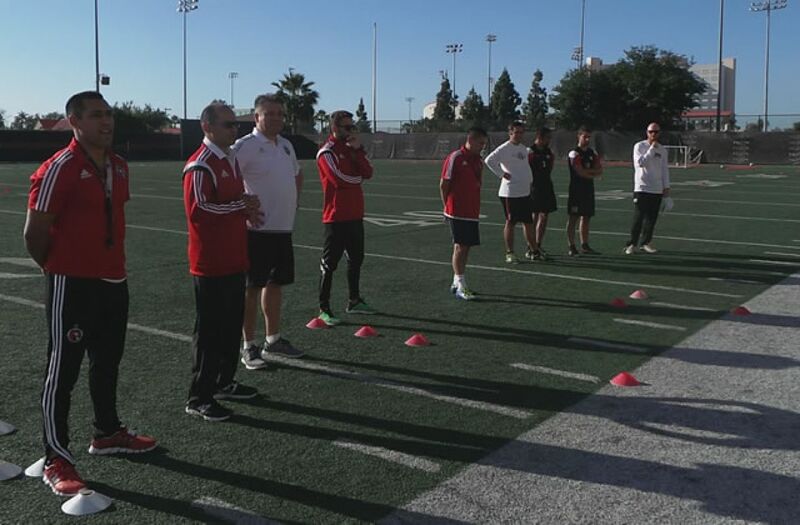 The clinic was followed by a friendly match between Club Tijuana’s Under-19 team and SDSU. Both teams played to a 1-1 draw. Club Tijuana plans to continue its relationship with SDSU Mens Soccer and the community through similar events in the future.